Cut the Rope has been an extremely popular game on iOS for years now, but it only just arrived on Windows Phone last week. 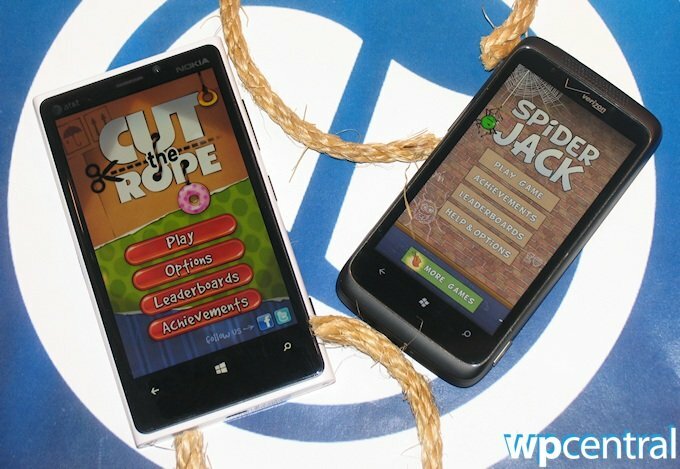 In the meantime, we’ve made due with Spider Jack, a similar puzzle game that arrived on WP7 back in December. 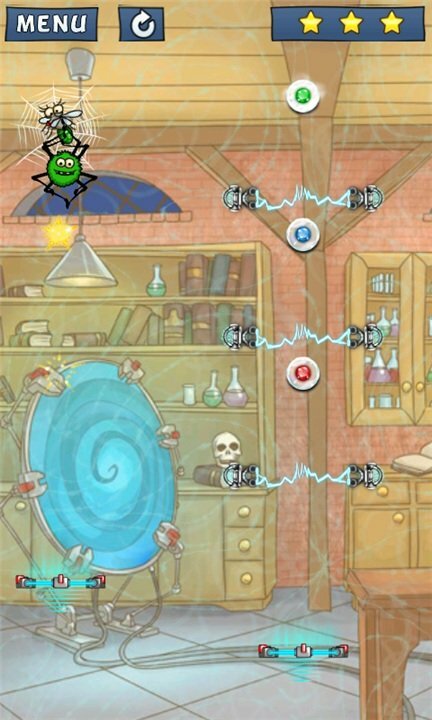 Cut the Rope originates from a Russian developer called ZeptoLab (though their UK branch crafted this port), while Spider Jack comes from the equally Russian MaxNick and publisher Electronic Arts. 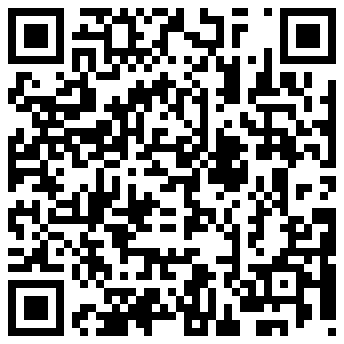 Now that both games are available (and playable on both WP7 and WP8 handsets), which one should you buy? Windows Phone Central answers that (sort of) in this head-to-head review. Spider Jack stars a scrappy green spider of the same name. As a brief and simple introduction shows us, Jack wants nothing more than to eat tasty flies. Now, I don’t care for spiders or flies, but I have to admit that flies bother me much more frequently than their arachnid predators, so I have to side with Jack on this one. In each level, the goal is to get Jack. from the starting point to his fly-filled spider web at the end. Jack moves around by attaching his web to anchor points; you just have to tap an anchor point within his range and he’ll latch onto it. He then automatically reels the thread in, pulling himself just below the anchor. Like Cut the Rope, you can also slash Jack’s line to break it, causing him to fall. But only Spider Jack lets you create the proverbial rope at will, significantly altering the game’s dynamics. Levels also hold anywhere from 3-5 stars for Jack to pick up as he heads towards his dinner. Some stars must be picked up within a certain time range or they’ll disappear. Stars aren’t just needed for Achievements; reaching certain milestones also unlocks further batches of levels. At present, the game offers five separate areas containing 25 levels apiece. More levels are promised for the future, but even though they’re short, 125 stages is no slouch. Depending on the area, Jack will encounter different obstacles and features. The Bathroom introduces bubbles that carry the spider upward until players pop them, as well as electrical gates that kill Jack if touched. The Laboratory has portals that send Jack from one location to another, sometimes making for tricky solutions. The kid’s Playroom has trampolines that bounce Jack around and gum that he can get stuck in. The recently-added Oval Office holds chained weights to avoid and spinning clock hands that cut Jack’s rope. Like Spider Jack, Cut the Rope starts out with a short introduction that introduces its protagonist, Om Nom (named after the sounds of eating). One day he mysteriously arrives on the player’s doorstep along with feeding instructions. An alien after my own heart, Om Nom absolutely loves eating candy. As his caretaker, you’ll have to give it to him. Note that neither of these games have an actual ending nor midgame cinematics, which I find slightly disappointing given the adorableness of the characters. 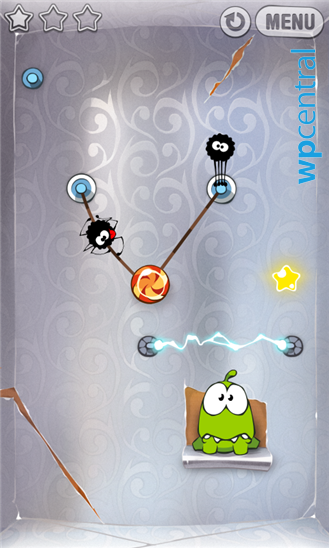 Cut the Rope, however has spun off a series of YouTube videos called Om Nom Stories. These delightful shorts combine live action with hand-drawn animation of Om Nom. The WP7 game actually links to the first YouTube video; pull down the chord on the title screen to see it. In Cut the Rope, players don’t control Om Nom at all. Instead, every level features a piece of candy attached to at least one rope. By cutting the rope, the candy falls, hopefully into Om Nom’s waiting mouth. To compare with Spider Jack, the candy is like the spider in that game, except you can’t directly make new ropes for it. I said levels have at least one rope, but in many cases the candy is attached to multiple ropes. When that happens, you can cut a single one or slice them simultaneously using two fingers. The trick is to get the candy swinging in the right direction by releasing the ropes’ tension. Also, if any of the ropes are pulled tightly enough to appear red, cutting that rope will launch the candy in the opposite direction at high speed. Though you can’t directly make new ropes for falling candy, said treat will automatically attach a new rope to certain objects within its range. The catch is it only attaches to each object once; cut the line and it won’t reattach to that same item. On top of stationary anchor points, the candy can attach to movable blue hooks. Sliding these hooks allows you to reposition the candy at will; you’ll even need to slide it quickly in order to slip the candy between tight spaces. 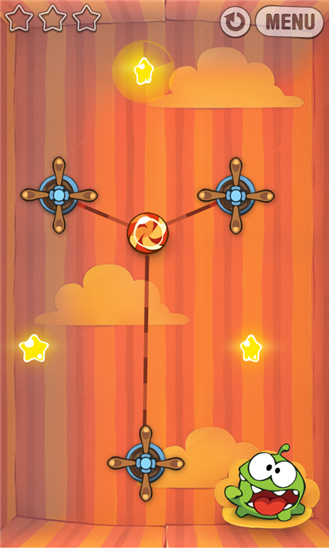 Unfortunately, the game sometimes misinterprets which action you’re trying to perform: cut the rope or slide the hook. Another type of object for controlling ropes is the spinnable wheel. By rotating the wheel, players can adjust the line’s slack. Cut the Rope has plenty of hazards and level-specific features worth mentioning, but I’ll just touch on a few. In the Valentine Box levels, the candy starts out in two pieces. You’ll have to combine them before the picky little Om Nom will eat them. Also, many stages have spiders for enemies. They climb along the rope towards the candy; cutting the line thwarts the assault. 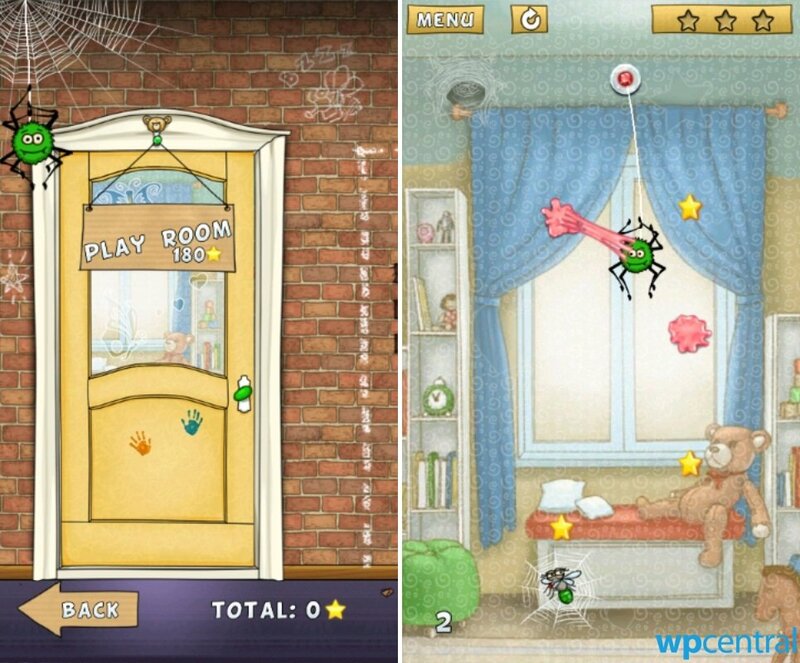 Funny how Cut the Rope’s closest competitor stars a spider, isn’t it? The bulk of Spider Jack’s Xbox Achievements revolve around collecting 300 stars during gameplay. Originally that meant perfecting every level, but updates have added new levels and something like 100 more stars since then. That gives players a nice deal of breathing room for grabbing the full 200 GamerScore, which this Achievement Guide underestimates a bit as taking two hours. Cut the Rope also has an Achievement for scoring 300 stars. The difference is you can get 300 stars about halfway through the game rather than near the end of it. In fact, 300 stars unlocks the fifth or sixth batch of levels out of a whopping 11 sets. As such, Achievement-minded players can get the full GamerScore without truly finishing the game. It takes less than three hours, according to Arsenic17’s Achievement Guide. Cut the Rope, being a huge selling and well-established iOS hit, as several advantages over Spider Jack. Most obviously, it packs 11 sets of 25 levels for a total of 275 levels (out of the iOS version’s 300). That makes it literally more than twice as long as Spider Jack, should you wish to continue playing after grabbing all the Achievements. Considering the huge number of levels, this one also packs more varied stage design and hazards. Now, even though it costs more, Spider Jack does have some advantages over Om Nom’s game. Both titles lack for musical variety, but I find Jack’s music much catchier than Cut the Rope’s. Jack himself also shows a bit more personality than Om Nom, if we ignore the separate Om Nom Stories videos. Also, Spider Jack loads levels and menus noticeably faster on WP7. But the reason I prefer Spider Jack to Cut the Rope is fun factor. See, I find Cut the Rope harder overall than Spider Jack. During my initial run through Spider Jack’s first 75 levels, I only once became stumped as to a level’s basic solution, and maybe four times I had trouble getting all of a level’s stars. By contrast, getting every star in Cut the Rope can be harder because you have less control over the candy, plus there’s more of a timing element to the puzzles. In later areas, I sometimes had to skip levels entirely because I just couldn’t see the solution. Everyone will enjoy each of these games to varying degrees. I’m certain that some folks enjoy Cut the Rope the most, especially given that it appears to have sold in much greater numbers. But both of these games represent slightly different takes on the same basic concept, and they’re both worth playing. The levels are short and generally easy to solve if you’re not concerned with perfection, making them great for on-the-go play. Since Cut the Rope costs so little, you’ll obviously want to buy it first. But if you crave another lighthearted game along the same lines, look no farther than the scrappy little contender: Spider Jack. Both games run well on WP7 and WP8. Update: Spider Jack has dropped to 99 cents as well. Don't miss it!